Nordic countries' decades-long peace and security engagement in Africa has centered on African interests, long-term partnerships, and building African capacity. In June 2017, the 16th annual Africa-Nordic Dialogue convened in Abuja, Nigeria. That same month Norway hosted talks between the Government of South Sudan and its opposition, the first time the warring parties had met face-to-face since July 2016. In neighboring Finland, the Burundi government and its opponents were meeting behind the scenes in negotiations spearheaded by former Finnish President and anti-apartheid campaigner Martti Ahtisaari. This confluence of events was not a one-off coincidence, but rather part of a long tradition of Nordic-African solidarity. 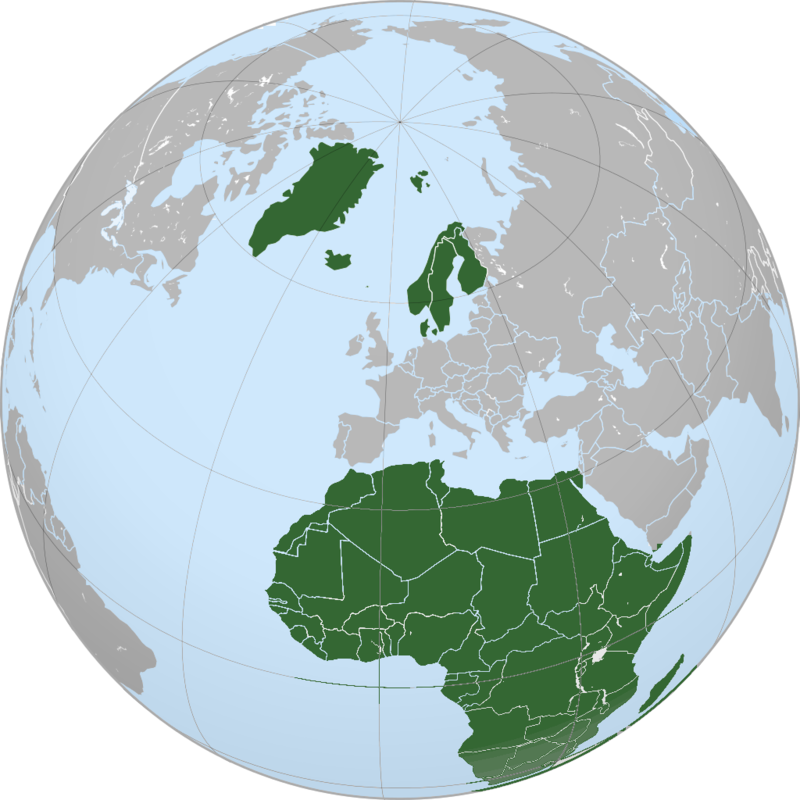 The Nordic countries (Denmark, Finland, Iceland, Norway, and Sweden) have a history of engagement in Africa dating back to the struggles against colonialism and apartheid. Initially, the Nordic countries focused on supporting African liberation movements. This later expanded to address the challenges of governance, development, and human security, with a heavy focus on peacekeeping and peacebuilding. 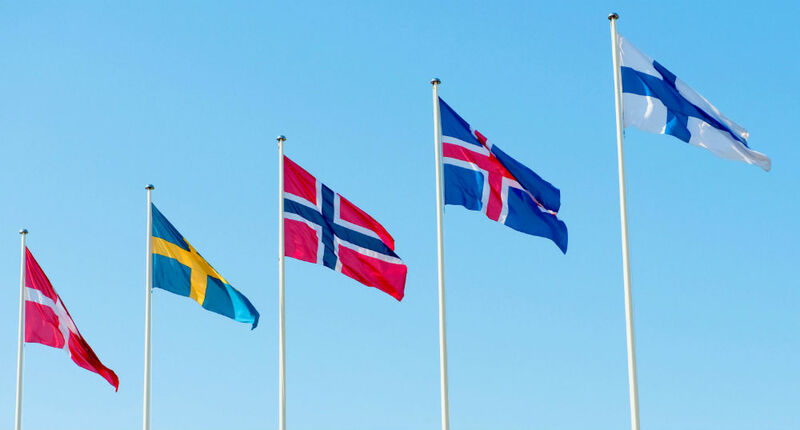 The Nordic flags: (from left) Denmark, Sweden, Norway, Iceland, Finland. Photo: Johannes Jansson. Today, Nordic-African relations are built on the values of democracy, solidarity, and holistic African development. Much of the emphasis of the Nordic model of engagement has centered on building African capacity through long-term technical assistance. Nordic-African solidarity is rooted in the century-old Nordic missionary presence in southern Africa. Unlike other Europeans that worked closely with colonial administrations, Nordic missionaries championed resistance to colonial rule. The church groups’ ties at the community level facilitated direct contact between African liberation movements and Nordic officials and helped shape an activist foreign policy in support of oppressed peoples. Trust in this partnership was further strengthened by the fact that the Nordic countries had no colonies in Africa. All this translated into significant Nordic support for African movements and causes, totaling approximately $4 billion between 1961 and 1986. These contributions at times represented over half of all Nordic non-military expenditures. One notable investment was to the Solomon Mahlangu Freedom College (SOMAFCO), established in 1975 in Tanzania. It educated thousands of South African exiles and provided leadership and vocational training. SOMAFCO, now a youth leadership trust, counts among its ranks distinguished alumni including South African cabinet minister Lindiwe Zulu and Henry Makgothi, the late deputy secretary general of the ruling African National Congress. Nordic development agencies and NGOs also built a hospital, farm, and training center on the site and supported many of its teachers and medical workers. Unlike other Europeans that worked closely with colonial administrations, Nordic missionaries championed resistance to colonial rule. The church groups’ ties at the community level facilitated direct contact between African liberation movements. Nordic contributions to shape the evolution of the African Peace and Security Architecture built on a model of engagement that fosters healthy civil-military relations, respect for human rights, strengthened civilian and military peacekeeping capabilities, and collaborative security. Demonstration of long-term commitment, transfer of knowledge, local ownership and leadership, and flexibility are important features of the Nordic countries’ approach. Military and civilian peacekeeping instructors from Denmark, Norway, and Sweden began deploying to the region in 1998. The fruits of these efforts came a year later when TFP coordinated Exercise Blue Crane—the first brigade-level SADC peacekeeping exercise—after which TFP began providing military and civilian peacekeeping training in military schools across SADC. Since then it has played a critical role in all biennial SADC peacekeeping exercises. In 2001, TFP expanded to the rest of Africa through a strategic partnership with the East African Standby Brigade and the Kofi Annan International Peacekeeping Training Center. In the 20 years since its establishment, TFP has trained 17,980 military, police, and civilian peacekeepers. The program also made a significant impact on doctrine. Seminal policy documents, including the Civilian Dimension of the African Standby Force and Protecting Civilians in African Union Peace Support Operations, were incorporated into the African Union’s operational procedures. Nordic countries are regarded as neutral and trusted actors, largely without a vested agenda. This systematic approach leverages Nordic resources to build African capabilities at both the bilateral and regional levels. 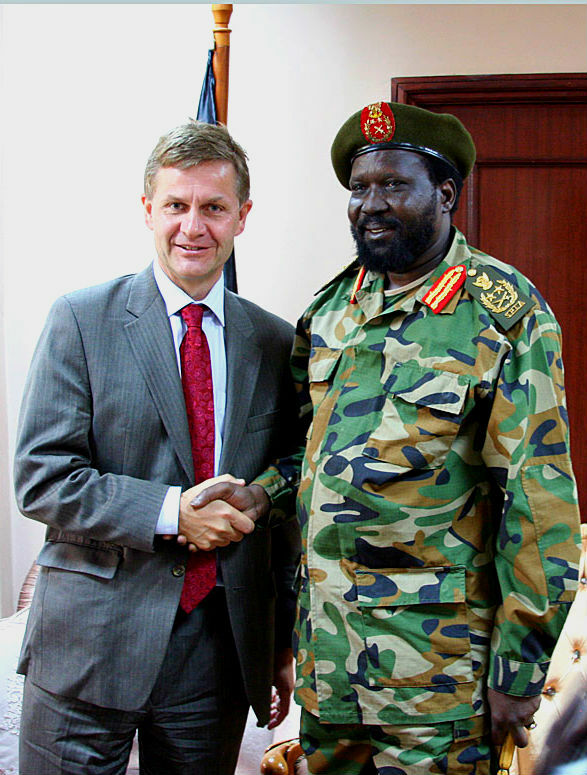 Erik Solheim, Norwegian Minister of the Environment and International Development, and Salva Kiir, President of South Sudan and Vice President of Sudan, during a visit to Sudan in 2009. Photo: Stein Ove Korneliussen. Norway’s role in the 2005 Comprehensive Peace Agreement between the Government of Sudan and Sudan People’s Liberation Movement (SPLM) is emblematic of the Nordic model. It was built on leadership development and people-to-people peacebuilding. Key activities included the 1999 Nuer-Dinka Reconciliation Agreement, several discreet intra-SPLM agreements between 1996 and 2003, and a military ceasefire in the Nuba Mountains in 2002. These were vital building blocks for the talks that eventually ended 50 years of civil war. Norway also used people-to-people peacebuilding, discreet engagement, and leadership development in supporting peace talks between Uganda and the Lord’s Resistance Army and between Ethiopia and Eritrea, as well as in Burundi, Somalia, and again in South Sudan following the resurgence of conflict in 2013. The Nordic states view development and security policies as interdependent and stress the importance of citizen security as opposed to regime-based security. Therefore, in addition to strengthening collaborative regional security, Nordic countries invest heavily in peacebuilding processes. The Nordic peace model involves back-channel diplomacy, indirect third-party facilitation, and direct mediation. It has its origins in Norway’s facilitation of Israeli-Palestinian talks leading to the 1993 Oslo Accords, lessons of which have been adapted to African contexts. As is the case with the TFP, Nordic peacebuilding aims to integrate the full range of Nordic capabilities into a coherent assistance program in support of the African Peace and Security Architecture. One notable tool is the Finnish-funded African Peacebuilding Coordination Program (APCP). Established in 2007, the APCP helped operationalize the AU’s Panel of the Wise by facilitating coordination between it and sub-regional mediation mechanisms including the ECOWAS Council of the Wise, the SADC Panel of Elders, and the Mediation Contact Group of the Intergovernmental Authority on Development. APCP also provides technical support to high-level mediators, and has trained over 200 young Africans for mediation roles in ongoing peace processes. The African Union Mediation Support Handbook, the AU’s official mediation framework, was developed with the support of APCP, building on best practices since 2007. The capacity developed in Africa through Nordic instruments such as TFP has contributed significantly not only to African efforts but also to United Nations initiatives such as the Civilian Capacity Initiative and the UN Police Strategic Guidance Framework Initiative. Using skills developed through these efforts, African partners established the African Peace Support Trainers Association (APSTA). This network of 16 peacekeeping training centers of excellence train civilian and military personnel getting ready for deployment in peace missions and conduct in-mission training and post-mission debriefs to capture lessons learned. Another African-led initiative includes a civilian standby force that generates civilian experts for the AU Commission and rapid deployment to AU peacekeeping missions. To strengthen these local efforts, Norway directly supports a number of posts in the AU Commission, all staffed by Africans. The Nordic countries’ long partnership has centered on African interests, equitable development, collaborative security, and solidarity. Above all it has stressed long-term engagement and shared values. The Nordic countries’ reputation as a trusted partner and the focus on building local capacity, ownership, and leadership have created tangible and ongoing contributions to the increasingly vital collective security structures seen on the continent today. Paul Nantulya, “Mediation: Undervalued, Yet Vital to African Security,” Africa Center for Strategic Studies, Spotlight, December 21, 2015. Cedric de Coning, “Contributing to Africa’s Peacekeeping Capacity: 20 Years of Training for Peace in Africa,” Conflict Trends, June 10, 2015. Marko Lehti, ed., “Nordic Approaches to Peace Mediation: Research, Practices, and Policy,” TAPRI Studies in Peace and Conflict Research, 101, 2014. Chris Saunders, ed., “Documenting Liberation Struggles in Southern Africa,” Nordic Africa Documentation Project, November 2009. Seán Morrow, Brown Maaba and Loyiso Pulumani, “Education in Exile: SOMAFCO, the African National Congress School in Tanzania, 1978–1992,” Human Sciences Research Council, 2005. Africa Activist Archive, “Interview with Tor Sellström,” video, October 13, 2004. Robben Island Museum, Mayibuye Center, and Nordic Africa Institute, “Nordic Solidarity with the Liberation Struggles in Southern Africa and Challenges for Democratic Partnerships in the 21st Century,” conference report, February 1999. Tor Sellström, “Sweden and National Liberation in Southern Africa,” Nordic Africa Institute, 1999.